The Raúl M. Grijalva Canoa Ranch Conservation Park comprises 4,800 acres of the original San Ignacio de la Canoa Grant. Hacienda de la Canoa is the name given to the 30-acre ranch headquarters in the 1920s by Levi Manning. People from all periods of time have contributed to the special history of this place. Historic Canoa Ranch is listed in the National Register of Historic Places. Come out for a tour, an environmental education program such as one of our bird walks or stargazing events, or just sit and enjoy the wildlife at Canoa Lake. You can also take a virtual tour of Historic Canoa Ranch or watch our promotional video. Historic Canoa Ranch welcomes you! Conserve Canoa! Your tax-deductible donation helps preserve and restore Historic Canoa Ranch. Click on the “Donations” tab below to learn more. Like us on Facebook to see more about Historic Canoa Ranch! Entry gate is open 7:00 a.m. to 4:00 p.m., 7 days a week, for Canoa Lake and access to the Anza Trail. Open Hours at the ranch are 8:30 a.m. to 12:00 p.m. on Tuesdays and Saturdays when tours are scheduled, see tour schedule below. Passport stamp available during these times. If you are unable to make a reservation online, or during business hours 8-5, Monday thru Friday, please show up for the Saturday morning tour and we will accommodate you. Sign up for a tour by clicking the register now button. You can also purchase an Annual Tours and Outdoor Activities Pass to get free or reduced cost for tours and programs. Call (520) 724-5375 or email canoaranch@pima.gov for additional information. Wednesday, May 22 • 9:00-10:30 a.m.
Wednesday, June 26 • 9:00-10:30 a.m.
Wednesday, April 17 • 9:00-10:30 a.m.
Wednesday, May 15 • 8:30-10:00 a.m.
Wednesday, June 19 • 8:30-10:00 a.m. Engage your creativity—draw, paint and write the desert’s story in this progressive mini-course with guided instruction in Art-Based Perceptual Ecology (ABPE) methods taught by ABPE pioneer, Dr. Lee Ann Woolery, ecologist and artist. Multiple sessions at three Pima County locations. Visit classes page for program details and online registration. Combine art-based practices with Western science methods and other ways of knowing to study the desert’s biodiversity. Guided instruction in Art-Based Perceptual Ecology (ABPE) methods taught by ABPE pioneer, Dr. Lee Ann Woolery, ecologist and artist. Multiple sessions at two Pima County locations. Visit classes page for program details and online registration. Come view our exhibit about the Anza Expedition. Canoa Ranch was a camp site for the Anza Expedition on their journey to San Francisco, CA. The Salcido's, the Murrieta's, the Ahumada's and the Grijalva's were just a few of the hard working Mexicano families that lived and worked at Canoa Ranch. Learn what the Baca Float #3 was and how it effected homesteading families in the area. Enjoy of the George Redondo Proctor Western Heritage Collection. How Scotch Farms played a role in bringing purebred Herefords to Canoa Ranch. The Manning's, the Schnaufer's, the Gayler's, and day to day life on the ranch. See many of the different tools that were used on the ranch. Call 724-5375 or email CanoaRanch@pima.gov for more information. Greeters are stationed inside the heritage area on the days public tours are scheduled. Greeters help visitors sign in for the tours and assist visitors with directions to restrooms and answer other general questions. 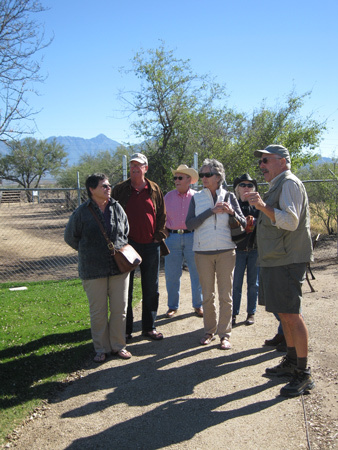 Volunteer Tour Guides interpret Historic Hacienda de la Canoa’s preserved and restored historic buildings and landscapes, cultural history, and natural resources at Raúl M. Grijalva Canoa Ranch Conservation Park for scheduled groups and the general public. 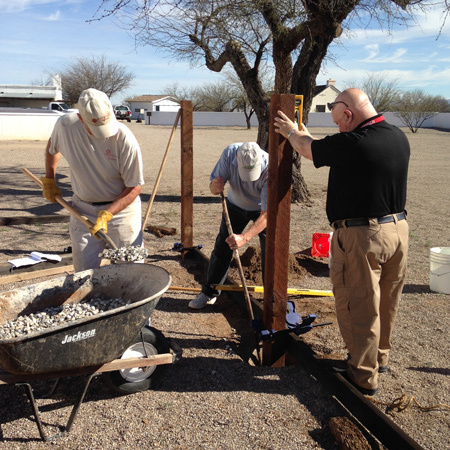 Stationed in historic buildings, stewards help keep display areas, artifacts, and other ranch memorabilia safe. Stewards are trained on information related to a specific display and are available to answer questions pertaining to a collection. 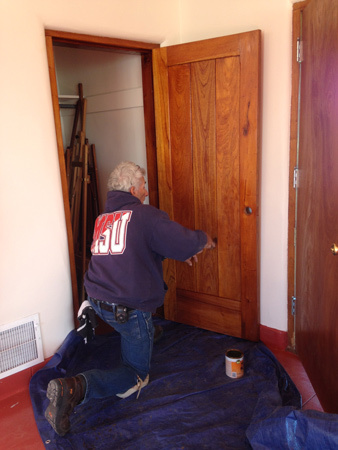 Volunteers assist NRPR staff with light restoration/construction work on the buildings inside the historic heritage areas. Projects will include painting, light woodworking, repair and restoration of the corral areas, and other light construction, repair, or maintenance work as needed. The Parklands Foundation is the ONLY website authorized to accept donations for Historic Canoa Ranch. Currently we’re seeking funds to restore the Tradesman House for a future visitor/story center and gift shop. Dedicating a tree or group of trees is the perfect way to honor your special person or organization. The first 39 commemorative trees will be planted along the entryway to the Historic Hacienda de la Canoa, the ranch headquarters for Canoa Ranch. The Entryway Grove has the important role of re-establishing the trees that lined the road into Canoa Ranch.